How Did You Come to Know the Truth? Do you really THANK GOD that He has opened your mind to His TRUTH? IS it precious — of SUPER value to you? Or do you feel like trampling it underfoot, as a sow would trample pearls or diamonds into the mud? This thought came while reading a letter from a member in England. It is a VERY RARE THING for my eyes to see a letter like this, though there are many THOUSANDS who have received the SAME TRUTHS as this member. It is a rather long letter, so I shall reprint here certain pertinent portions. He writes: "Dear Mr. Armstrong: I very much appreciate the opportunity to write directly to Christ's apostle, and in just a little way to thank you for the tremendous example you are setting us and, above all, to thank you for God's truth. "When I reflect on the precious truths of God's Word — the knowledge of what man's future is, the coming Kingdom of God, the spirit in man, the history of the angels, the origin of human nature, what God is, and on and on, then I am truly grateful that God has called me into HIS Church — the only church on this earth that has the truth. "But, Mr. Armstrong, this Church has the truth only because Christ gave it to us through you. You are Christ's chosen and ordained apostle, and it is through you that I have learned and understood all these things. "How well Christ chose, trained and prepared you for your present responsibilities — and how glad I am that you are now directly involved in running the Church day to day under Jesus Christ. "When I look back over the past three or four years I am appalled at what happened in your absence from Pasadena, of how the doctrines of God the Father — taught by Jesus Christ to His apostle — were so watered down and changed that this was scarcely God's Church anymore. "When I consider healing, which the Head of this Church Jesus Christ considered so important that it was one of the earliest doctrines that He taught you (within a year of your picking up a Bible), then I am amazed at how effectively Christ's doctrine was rejected (and even to this very day it seems that many in the church here locally are unable to really accept healing as an unbreakable PROMISE of God; the POISON of STP has done its work too well, sir, and seems to have destroyed the living FAITH which was present in the Church when I first started attending). "So, Mr. Armstrong, I daily thank God for your restoration to good health and DYNAMIC POWER. Please, keep writing powerful articles setting us straight doctrinally; we need to hear from you. I totally believe that Christ puts His truth into this Church through you, and so I am looking to you more and more now than I ever have before. "How often the apostle Paul wrote to his converts that they should IMITATE him, learn from him, follow his example, observe his faith and so on. Well, the apostle Paul is now dead — but there is a living apostle of Jesus Christ! "And I hope — and pray — that God will give me the understanding and strength to follow, and to imitate, His apostle in this day and age. How useful is your autobiography in this regard! Thank you for writing it; it is a goldmine of advice and examples in practical living and Christianity! "Mr. Armstrong, I find that the articles you write have a ring of truth to them. When I read them, I just know that they are right; and I am not exaggerating when I say that I literally EXULT when I read them — I really do rejoice at God's truth (although sometimes it hurts)! "And so I tend to study your articles VERY CAREFULLY. I am often surprised at how much I miss the first time I read them — you pack so much into your articles! As I study, much is committed to memory (at least in general terms); my purpose is to see things as you see them — to have your mind (and hence Christ's mind) on various issues. "And that brings me to the main purpose of writing this letter. "Three or four months ago I was intensively studying your article on "How Christ Gives the Church Its Beliefs," which appeared in the November 20th, 1978, Good News. I memorized its main points, and thoroughly marked up my Bible — especially at Matthew 16:18, on the subject of binding and loosing. "I was then staggered — left literally speechless — when I read an article in the March, 1979, Good News, which, in my eyes at least, just plainly CONTRADICTS what Christ is saying through you! Whereas Christ teaches, through you, that binding and loosing is given only to His apostles, the author of this particular article states that the ministry have the authority to make binding and loosing decisions." Let me add here that the particular article in question was a "REPEAT" article, which had appeared several years ago in The Good News. At that time no official doctrine had been made in the Church about "binding and loosing." I did not reread the article prior to republication in the March, 1979, Good News, and I am sure the author of the article did not recheck it, either. I made the doctrine of "binding and loosing" official only a few months ago. I do not remember catching anything in this article that should have been edited when it first appeared several years ago. So I will personally assume any blame for this discrepancy. I should have reread this article prior to its being reprinted in the March, 1979, Good News — but since I knew it was a repeated article from several years ago, I neglected doing so. 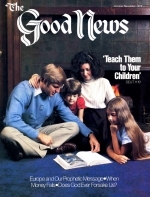 With all the day-to-day administration responsibilities over the entire globe-girding Work, it is difficult for me to read every article in The Good News and The Plain Truth before publication. I trust our brother in Christ in England, who wrote the above letter, will forgive me.